Editor’s Note: This is the second of an exciting four-part series here on The Middle Spaces—co-organized and co-edited by Joshua Kopin—a round table of fifteen different scholars discussing the intersections of sound and comics (and sound in comics). Be sure to go back and read part one as well. Full bios for all our contributors can be found on the Guest Writers page. Our round table continues today with three more scholars asking questions about the use and role of music in comics and the form of the book and record set. 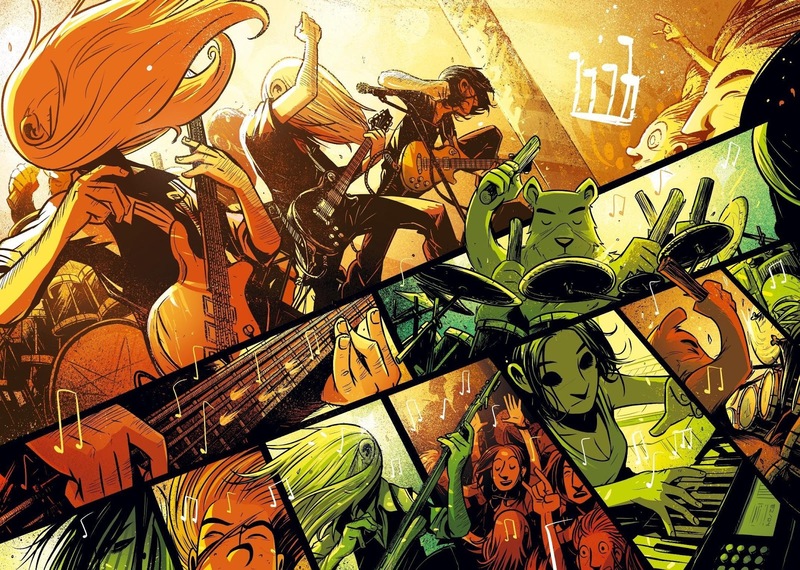 Do comics and music make community possible? 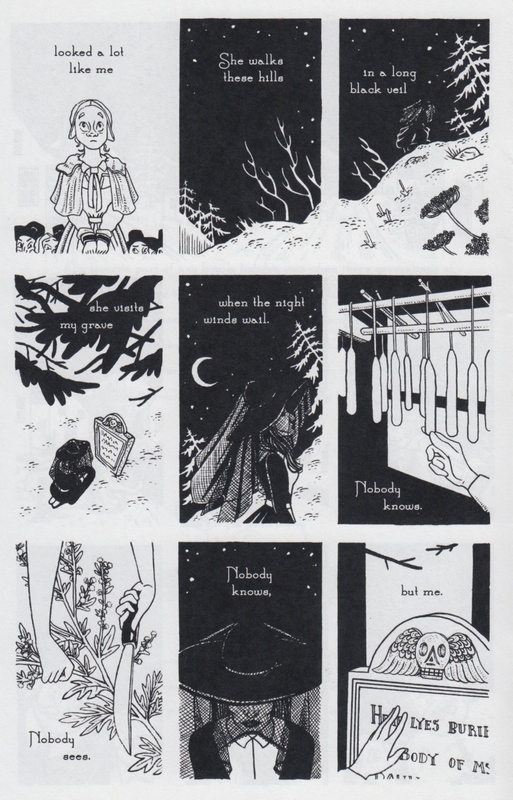 The comic, which earned Rotman a 2017 Ignatz Award nomination for Promising New Talent, includes a brief introduction in which the artist pays tribute to her “favorite part of any family holiday,” the moment “when three generations of women would gather together to sing murder ballads.” In that tradition, singer, songwriter, and guitarist Jenny Owen Youngs recorded a version of the song to accompany the comic. Rotman points out that she and Youngs have reimagined the tune as “an old-timey lesbian witch ballad.” A kind of modern day book-and-record set, Long Black Veil raises questions about the role that rituals—family or otherwise—might play in the comics medium. I should pause here to explain what a book-and-record set is for those of you too young to remember them. In the 1970s and 1980s in the U. S., Peter Pan Records released numerous adaptations of comics featuring characters ranging from big names like Superman and Spider-Man to more obscure (and scary) creatures like Man-Thing and Werewolf by Night. Each comic included a 45 rpm record with actors performing the roles of the main characters, plenty of sound effects, and atmospheric music. 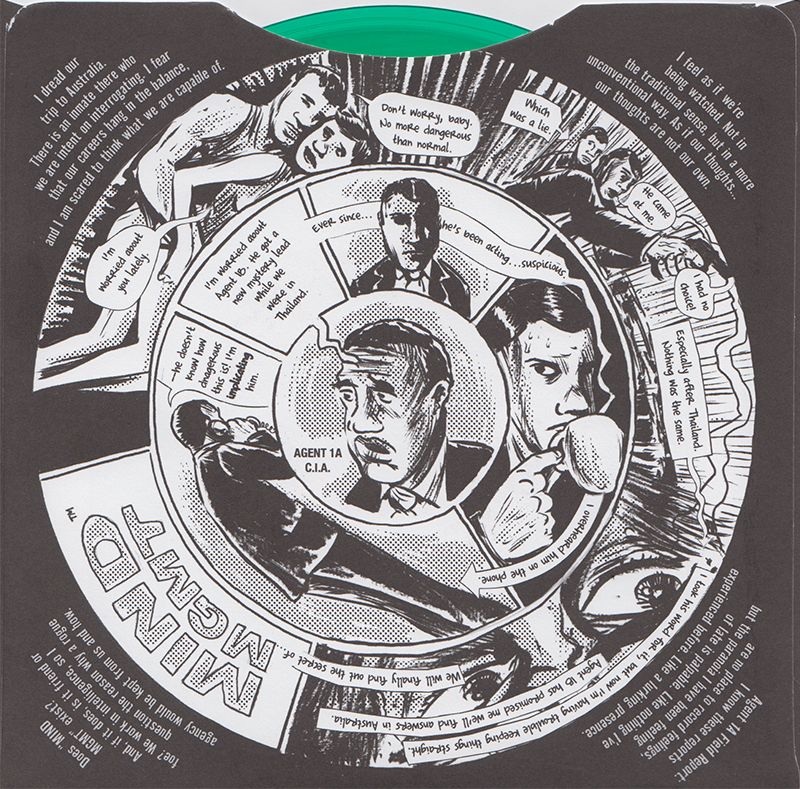 Over the last few decades, other comics have included various combinations of words, pictures, and music, from Tim Truman’s flexi disc soundtrack for Scout #19 (1987) to John Porcellino’s multiple references to post-punk band Hüsker Dü in Perfect Example (2000). As a contemporary example of this tradition, Rotman’s comic is especially notable and moving. In the black and white landscape she evokes in these pages, she not only pays tribute to these family memories but also provides a template that other cartoonists and musicians might follow. Look closely: on the comic’s second page, a young woman stands on the gallows, an image from the past. Then, as the song’s refrain begins in the second panel, Rotman draws a world that mirrors that of her native New England: sloping hills, evergreens, yarrow plants in the foreground. A figure wearing the veil appears in the third panel. Then, in the sixth, the narrative flashes back again to the first steps of a ritual. The veiled figure selects a candle and, with a long-bladed knife, cuts leaves and branches from what appears to be a ragweed plant. “Nobody knows,” the first caption says, and “Nobody sees,” says the second. While in most recordings of the song, the singer is a ghost, watching as his lover visits his grave, Rotman introduces a subtle change in perspective here: “nobody knows” and “nobody sees” the community of women who crafted these folk traditions depicted in the comic. While the original song focuses on the crime for which the singer was accused and its tragic aftermath, Rotman and Youngs draw our attention to the heteronormative and patriarchal world in which these characters fight for survival. That world is also a secular, materialist one, ignorant and dismissive of the folk traditions that bring life and vitality to this otherwise austere environment. In song and image, Youngs and Rotman elevate these seemingly ordinary, insignificant objects—the candles, the branches, the wildflowers—and return to them, and to the woman who collects them, a power that is both haunting and majestic. In her version of the song, Youngs’s voice is at the center of the mix, but her electric guitar provides an essential second voice that echoes the eerie quality of Rotman’s drawings. That guitar—later joined by a ukulele, an acoustic guitar, percussion, and a droning synth pad—provides the harmonic foundation of the song. At the same time, its slightly distorted, midrangey timbre might be an echo of the lover’s voice, a response to the ghost not found in the lyrics themselves. In the chorus, for example, as Youngs finishes the refrain—the “Nobody knows”—she hits the V chord of the progression and lets it ring out. That full and open G major sparkles as Youngs sings “but me,” then returns to the I chord, the C major that will lead us to the second verse. Before that part of the story, however, Youngs alternates between the I and the IV chords. After strumming the F, she walks back down to C, a move that heightens the listener’s feeling of suspense. What will happen next? Read along with the comic, just like a Power Records set, and that movement from the C to the F chord and back again falls in between the second and third pages of the comic. In that infinite space between the pages—in that gutter where, Scott McCloud suggests, just about anything becomes possible in the imagination—Youngs’s electric guitar serves to ground the reader, to act as a guide from one scene to another. That guitar reminds readers that, on this journey, no one is alone, not even the ghost, that restless spirit who will eventually be reunited with their lover. By filling that space with sound, Youngs gives the reader a chance to “imagine,” as Prince once put it, “what silence looks like.” The spaces between the chords suddenly mimic those between Rotman’s panels. The relationship between Rotman’s comic and Youngs’s powerful cover of “Long Black Veil” also creates a space that looks and feels something like home. Art and music here are not ends in themselves. Rather, they celebrate the community that family rituals and traditions make possible. 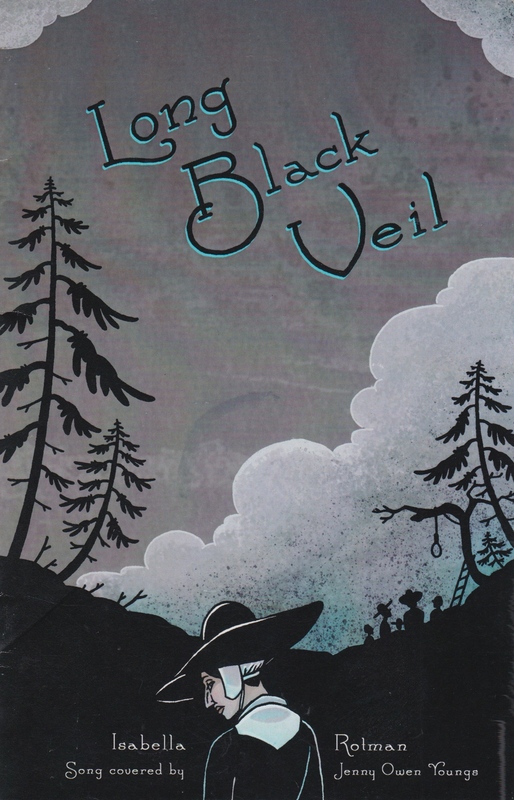 “This comic is much better when read with the song,” Rotman notes on the inside front cover of Long Black Veil. Working as a team, Rotman and Youngs create a sense of community sometimes absent from comics, which too often privilege the solitary reading experience over the communal joy possible, for example, when performers and listeners interact with each other through music. Then again, in her other work, Rotman has proven herself time and again up to challenge of elevating words and pictures into a form that makes social and political change possible. From Dig and Burn Your Demons to educational comics like Not on My Watch: A Bystanders’ Handbook for the Prevention of Sexual Violence, Isabella Rotman employs her tremendous skill as a visual storyteller to conjure other worlds in which alienation gives way to community, silence gives way to song, and uncertainty leads inevitably to magic and to love. How are sonic and haptic experiences related in The Mind MGMT Recruitment Book and Record? Matt Kindt’s Mind MGMT series, published by Dark Horse Comics between May 2012 and August 2015, follows a secret espionage organization whose agents have psionic powers. The eponymous Mind MGMT often relies on agents who can manipulate media in order to coordinate friendly agents, attack enemy agents, and secretly manage the general population. The series is known for the secret messages and intelligence files that constitute the paratext for each issue and encourage readers to imagine themselves as agents within the world of Mind MGMT. More than simply uncovering bonus content, the reader’s active engagement with the fictional world fosters an embodied reading experience. Paratextual elements in individual comics may be pieced together to discover pertinent information or a well-placed clue may send readers digging through past issues to decipher hidden meaning. The result is a series invested in the ways that lived reality and narrative reality are bridged through the body of the reader. Matt Kindt’s recent release of The Mind MGMT Recruitment Book and Record further amplifies this connection established by the original series through its guise as a recruitment tool for new agents. Combining haptic and sonic experiences, the book-and-record set provides opportunities to think about the ways that our bodies mediate our relationship to comics. Similarly, The Mind MGMT Recruitment Book and Record promises “a fun-filled training exercise in music and story” that will teach the reader how to decipher what they are seeing through the record’s sounds. However, this is not a typical book-and-record set. Rather than enhancing the ability to read the book, the slogan on the Recruitment Book and Record promises that the reader will “SEE the pictures, HEAR the record, THINK our thoughts.” Disneyland Records promised an absorptive reading experience that provided entertainment while the narrator guided the reader through the book. In contrast, the Recruitment Book and Record features “dissonant word story narration” and “subversive character dialogue” in addition to “subliminal sound effects,” “ulterior motives,” and “backwards masking.” Sight and sound remain inseparable, but the reader’s experience is no longer seamless. Divergent sonic and visual information call attention to the fragmented narrative as well as the vinyl record and comic book as material objects themselves. As a result, the process of reading and listening is as much about the physical relationship between the reader and these objects as it is about narrative content. Vinyl records have a distinctly material existence that is fundamental to the Recruitment Book and Record. The analog format requires a record player as well as knowledge of the sizes and speeds at which records are played. Therefore, the book-and-record set anticipates a reader who already has a physical relationship with sound. Beginning on Side A, instead of McElroy announcing that he is the “story reader,” which would echo the beginning of the Disneyland Records sets, what comes through the speakers is unintelligible. Listeners familiar with the advertisement’s reference to “backwards masking” will understand that this message should be played backward. The listener must adjust the record player to hear the message (“Agent initiation and strength training begins now”), reset the record to play forward again, flip the record to hear Side B, and adjust the record player again to hear the second backward message (“Agent initiation complete. Await further instructions”). Consequently, the haptic experience of manipulating the record becomes an essential part of the narrative content. Heightened attention to the record also amplifies the reader’s interaction with the comic book. Narration begins after the backward masking on Side A: “Hello, boys and girls. This is your Peter Pan storyteller. When you hear this signal (chime), turn the page. Alright? Here we go.” The arrival of the storyteller implies that the narrator will help the reader unite sound, sight, and touch to create a cohesive whole, and the first page of the comic book follows this expected structure. Turning the page following the chime, however, the narration becomes untethered from image and text. The record and the page tell versions of the narrative that diverge more than they converge for the rest of the book. On some pages, the narration of a page lasts longer than the process of reading the page, and the eyes of the reader are left to wander. On other pages, the sound moves faster than the reader can take in the image and text. The sound of the chime and the act of turning the page evoke an awareness of the objects that define them, and, like the larger Mind MGMT series, the reader’s body is placed at the intersection between narrative and experience. Not only does The Mind MGMT Recruitment Book and Record disrupt the reader’s perception that they are separate from the comics page, but it also foregrounds the ways that the reader’s body can affect their navigation of the narrative. In contrast to the purely visual or textual representation of sound, the book-and-record set uses the senses of hearing and touch to direct interpretations of sound as well as the temporal structures both within and between panels. Incorporating the record’s sonic experience into the process of reading the recruitment book prompts new ways to think about how embodied reading practices impact our understanding of the comics page. How can multimediality make music in comics audible? J.P. Ahonen is a metalhead and a comics artist and, as his work conjoins the two, he has had to develop ways to make comics sound. It is essential for his work that it makes the audience hear the music at the center of his two major metal works Perkeros [Sing no Evil] (2013 with KP Alare) and Belzebubs (2016 – present), but this endeavor is hampered by the “silent” nature of the comics form. Traditionally, comics have had to rely on text and image as the only media that can suggest an impression of how sounds might sound – exemplified by the use of onomatopoeia, which convey certain sounds through the use of sound-mimicking words and visual effects like color, fonts, shape, and line work. Ahonen, when writing stories about metal bands, suggests other ways to make the readers hear the music that the bands are playing. Here, I will discuss the ways in which Belzebubs is an example of how comics can address the challenge of expressing sound in comics by working in an expanded field through which the already multi-medial form of comics can include the mediality of riffs, blast beats, and growls to augment our understanding of what comics can do. Belzebubs’ general devil-may-care approach to metal and comics, opposing the purists in both camps, operates in a complicated realm of multi-modality, intermediality, transmediality, and multimediality. Irina O. Rajewsky’s Intermedialität (2002) defines intermediality as the crossing of borders between at least two distinctly perceived media and transmediality as a media-unspecific phenomenon that can appear in different media and does not have a clear original medium. In “Intermediality, Intertextuality, and Remediation: A Literary Perspective on Intermediality” (2005), she further distinguishes between three types of intermediality: medial transposition, medial combination, and intermedial reference, where the combination of text and image in comics is considered medial combination or multimedia. Belzebubs is multi-medial in that it combines text and images like a paper comic but expands its multimediality by adding other media to its form: music, animation, etc. Since it has a clear original medium, Belezebub cannot be considered a transmedial story. The reader can “hear” the avant garde metal of Perkeros by picking up on visual clues: the way the drummer breaks the frame, the close-ups of fingers cradling the guitar fretboard, the depictions of notes, the contrasting colors, the diagonally tilted panels, the use of the spread to fill up the entire viewing field of the reader, and the impact of the music on the audience – horns flying and hair blasted backwards. This aspect of intermediality is what Rajewsky calls the “as if” reference: “an intermedial reference can only generate an illusion of another medium’s specific practices” (2005: 54-55). The comics form has a long tradition of combining verbal and visual elements to suggest audible qualities, and Ahonen relies on this in Perkeros. In Belzebubs, however, he explores the possibilities of a digital format to enhance the experience of music in comics by adding media that goes beyond the “as if” reference. In this “trve kvlt documentary in comic strip form,” Ahonen simultaneously narrows and widens the formal possibilities of how the music of the band reaches the reader. Belzebubs chronicles the family life of fictive black metal band Belzebubs’ lead singer and guitarist, Sløth – including the challenges he faces with the running of the band. The strip is drawn in a rounded humor comics strip style, but true to its black metal content it is in black and white, which precludes Ahonen from using color as means to connote specific sounds visually. The strip is published across several online platforms (Tumblr, Facebook, Instagram, Twitter, webpage) and it playfully engages with black metal culture with an expansive understanding of what comics might be, mixing tour posters, Spotify lists, transit maps, 360 views and SMS conversations in between strips. In the example above, the mixed fonts display how Sløth’s vocals in the early days still needs some work to match the “evil” and dark aspirations of the band. This use of fonts is well-known in comics and it ties in with how Belzebubs’ humor relies heavily on established mythologies and aesthetics within black metal culture. The first growl evokes cuteness due to its rounded font, the second resembles a metal logo, and the last appears to be an attempt at growling that sounds more sinister, based on the frazzled outline of the font. Yet, this final growl still carries remnants of the original cute sound quality, an amalgamation that is signified with the skull with hearts as eyes subbing as the letter a. Having restrained the comic’s audible options with restrictions on panel layout and color, Belzebubs experiments with a difference between imagined sound and audible sound in that sound and motion are sometimes introduced in GIFs within the strips. In terms of content, this tiny expansion of what the strip can do does not significantly alter anything, but it does add the important aspect of sound that allows the reader to become a listener – not having to imagine the virtuosity of Sam’s drumming exercises. The reader’s sense perception of sound is moved from “as if” reference to the hearing of actual music. This addition is possible because of the digital format of the comic and is even further advanced by the possibility of listening to the band on Youtube. The video “Blackened Call” is clearly drawn by the same artist, showing the same characters and using the same tongue-in-corpse-painted-cheek humor. With a complete album scheduled for release April 26th, 2019 and a growing merchandise shop, Belzebubs is going multimedial in a grander fashion. Renowned American comics publisher Top Shelf is even publishing an English paper version of the strips following their publication in French, Greek, Finnish and Spanish, anchoring the work in a more traditional comics format. Belzebubs is a project that began as improvised doodling online, and in its free form willingness to explore multi-medial avenues for comics, it pushes the boundaries of what comics can do, insisting that audio and movement can act as integrated parts of comics. In that sense, the long-awaited paper version of Belzebubs represents a more traditional way on engaging with sound in comics and does not fully offer the possibilities of going beyond a text/image performance that sounds “as if” it is music. Thanks again to our three contributors and come back next Tuesday for part three of our Seeing Sounds / Hearing Pictures round table featuring four more explorations of questions on sound in comics – in particular the politics of silence and gender, indigenous representation, and language.